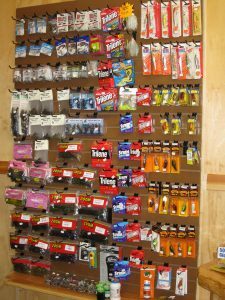 Joe Bass Tackle Shop is open 10am till 4pm, 7 days a week. Live bait and loaded with only the best quality fishing items. Phone: 417-538-0383. During the summer months they have handcrafted Ashby’s Sterlings ice cream! In addition to the tackle shop, this location features a fisherman friendly dealership: Sport Boats USA offering only the finest quality new and pre-owned boats, Skeeter, Express, Veranda, Lowe, & Four Winns.